Social networking websites are among the most popular ways of nurturing professional relationships today, says Pallavi Anand, director of Robert Half Hong Kong. “With the increasing popularity of social media and professional-networking websites, it has never been easier for employers to look up the background of an individual on the internet. Personal profiles on social media enable employers to get a broader perspective of a candidate which they might not be able to discover during an interview process,” she says. However, in a recent Robert Half survey conducted with 150 chief financial officers and finance directors in Hong Kong, 7 per cent of respondents said they never trust the information on LinkedIn profiles, while 69 per cent conceded they only found the data posted to be trustworthy “sometimes”. 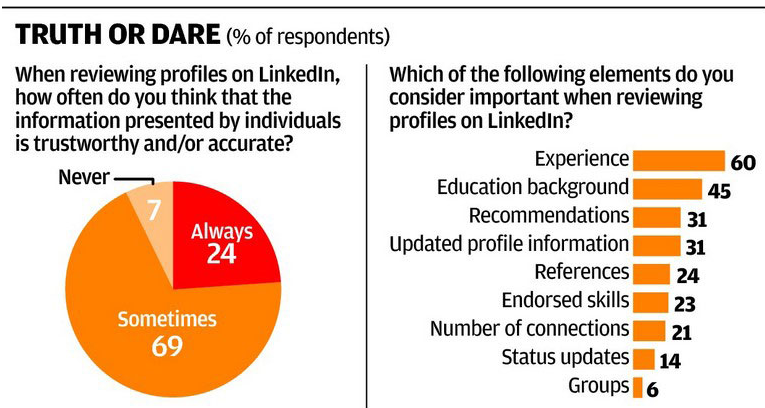 Among the respondents who questioned the accuracy of LinkedIn profiles, the key concerns were the lack of a system to qualify information (51 per cent), the possibility of exaggerated experience or skills (24 per cent), the relative anonymity of social media (17 per cent) and the fact that the data is not regularly updated (8 per cent). These figures also explain why conventional employment applications are still more prevalent, with 85 per cent of respondents believing these to be more reliable than using LinkedIn. “Despite the increasing popularity of social media in Asia, our findings indicate that the Hong Kong respondents surveyed still consider directly received applications for employment to be more reliable than through LinkedIn profiles,” Anand says. Firms in some sectors, such as law, banking and financial services, go as far as to discourage their staff from social media, with the confidentiality and sensitivity of the data handled by such firms making them much less receptive to such tools. John Mullally, associate director of financial services at Robert Walters, says some high-profile firms dissuade their staff from using these sites for a different reason. “Some of our clients, including a good few investment banks, do not like their employees creating a LinkedIn profile as it makes them more accessible to headhunters. They realise that HR and recruitment professionals are some of the bigger users of LinkedIn and they want to shield their staff from being poached,” Mullally says. Nevertheless, when it comes to recruitment, Mullally sees LinkedIn as a good thing in general, with in-house recruitment and HR teams utilising it for day-to-day hiring needs which reduces the dependency on external recruitment firms. Mullally adds that while social media is a valuable marketing and communication tool, it also poses a significant risk for companies. Many financial-services firms now hire IT auditors and operational risk analysts to identify and manage such risks. In the recent Aon Global Risk Management Survey 2013, out of 49 global risks, social media was ranked at 40 – higher than the threat of terrorism and share-price volatility – due to its ability to ruin a company’s reputation in the time it takes to tweet. Mark Enticott, managing director of Ambition Hong Kong, explains that social media enables traditional media to quickly pick up on negative news and broadcast it to the public. Simon Lance, regional director for China at Hays, thinks that if a company invests enough in social media and takes the time to understand it, these issues should not be a problem. Hays has a close partnership with LinkedIn, with the company being the most-followed recruitment consultancy on the website.